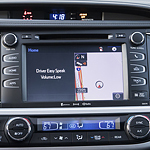 A fully integrated multimedia navigation and telematics system, Toyota Entune gives information via satellite on gas prices, sports scores, news, stocks, traffic, weather and more through a SiriusXM radio subscription. Available in many of Toyota's latest vehicles, it's based on Toyota's G-Book architecture. Toyota's Entune system is easy to use and organized well. The useful array of physical buttons complement the touchscreen for easier access for everyone. The performance of the system is quick so you won't have annoying lag times when listening for directions, news updates, weather forecasts and more. Entune provides USB ports that provide 5.0 volts to charge up your devices and keep you connected. Want to try the Toyota Entune system for yourself? Visit us today at Mann Toyota in Prestonsburg and take a new Toyota for a test drive and give it a try.